Last week I scooped the story that Donald Trump’s former business partner, Felix Sater, possibly used to own a number of obscene domain names intended to disparage Sater’s Bayrock Group colleague, Jody Kriss. In 2010, Kriss sued Bayrock for $1 billion, alleging that the New York real estate company and its partners, including Donald and Ivanka Trump, had illegally concealed Sater’s 1998 racketeering conviction and later 1999 sentencing. Apparently, somebody thought this was the perfect opportunity to troll 2016 presidential candidate Ted Cruz. Yesterday, an anonymous troll re-registered IAmAFaggot.com. Only instead of Sater’s old site, visitors are now redirected to a blank page that says “Ted Cruz Is The Zodiac Killer,” before being redirected yet again to Cruz’s official U.S. Senate site. According to Whois.com, the registrant used a privacy service to obscure their real name. However, a reverse Whois search shows that the site is hosted on a server owned by Austin native Steven Hughes. 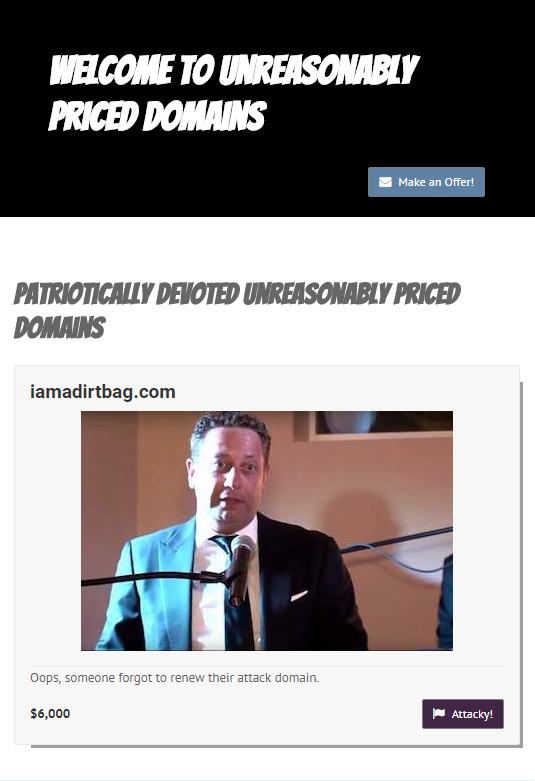 Another domain mentioned in the articles, IAmADirtBag.com, is currently on sale for $6,000 at UnreasonablyPricedDomains.com, a side project of Brooklyn native Jeff Koyen’s Chaotic Neutral, a satirical site about management speak.